At home and abroad, one of postindependence India’s defining characteristics is that the nation has managed to sustain democratic governance in the face of striking ethnic, linguistic, and religious diversity. In the early years after independence, the country’s first prime minister, Jawaharlal Nehru, and the ruling Indian National Congress (or Congress Party) advocated for an Indian brand of secularism designed to hold the country’s disparate communities together under one roof. Indeed, Nehru often pronounced that India’s composite culture was one of its greatest strengths. The Hindu nationalists who later came to populate the Bharatiya Janata Party (BJP) and its various ideological affiliates have consistently harbored a starkly different view; they envision India as a majoritarian nation-state, not a multicultural one. The tensions inherent in these competing visions of Indian nationhood have come to the fore in recent years, especially since the BJP’s landmark electoral victory in 2014. To understand these dynamics, it is necessary to define basic concepts and review relevant history. This is because political entrepreneurs who promote ethnoreligious identities—especially Hindu nationalist ideologues—have created much confusion around the notion of secularism, claiming that its proponents have endeavored to make the state hostile or indifferent to religion. That was certainly not the intention of the architects of modern India, whose enemy was not religion, but communalism. Nationalist forces aside, all is not well with Indian secularism. Even before Hindutva forces began attacking India’s secular tradition, the Congress Party had already started undermining secularism by cynically jockeying for the support of different voting blocs and by stoking divisive issues of social identity (a practice known as vote banking). In parallel, the judiciary—especially at the lower levels—has adopted a majoritarian undertone on certain controversial cases. 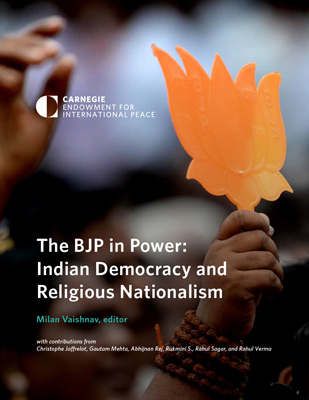 Whether secularism can maintain its hold as a defining ideology for the country will depend in part on a combination of political forces—namely the BJP’s future electoral success and the strategies the opposition adopts to counter the ruling party. At the dawn of India’s independence in 1947, advocates of secular nationalism decisively won the debate over how the state should navigate the tricky terrain of India’s religious diversity. At the time, there were two other competing visions for how the state should handle religion, namely Hindu nationalism and Hindu traditionalism. The Hindu nationalists held that Indian identity was embodied in Hinduism because Hindus formed the country’s majority community and were sons of the soil. By contrast, Hindu traditionalists were less interested in such a stark ethnic view and paid more attention to cultural features, like the defense of traditional Hindu (or Ayurveda) holistic medicine and the linguistic preeminence of Hindi over Urdu, which many Indians regarded as a foreign language. Whether secularism can maintain its hold as a defining ideology for the country will depend in part on a combination of political forces—namely the BJP’s future electoral success and the strategies the opposition adopts to counter the ruling party. While Hindu nationalists were almost completely absent from the Constituent Assembly that was charged with drafting the country’s constitution, Hindu traditionalists—who formed the right wing of the dominant Congress Party—were well represented. In spite of the pressure they exerted, Nehru and the head of the assembly’s drafting committee, B. R. Ambedkar, argued successfully in favor of a form of “composite culture” that, in India, is called “secularism.”1 In the simplest terms, proponents of the secular brand of Indian nationalism define the nation politically, as comprising those who inhabit sovereign Indian territory, and as a place where all citizens are equal. Although the word “communalism” has largely disappeared from India’s modern political lexicon, during the Nehru years, it was widely used to designate ideological forces that sought to divide the Indian nation along religious lines. Nehru believed that Indian secularism was vital because he had seen firsthand how Muslim communalism had resulted in the division of the country (into India and Pakistan) in 1947. For him, the Partition of the subcontinent had not only cut Indian territory in two but had also divided a civilization. Following independence, Nehru considered Hindu communalism to be the country’s top enemy; his fears were heightened after Nathuram Godse—a man associated with the Rashtriya Swayamsevak Sangh (RSS), the ideological wellspring of Hindu nationalism—murdered Mahatma Gandhi in 1948. Indeed, as political theorist Rajeev Bhargava has argued, Indian secularism has not meant that the government abstains from intervening in religious matters.5 On the contrary, the state has decisively intervened in religious affairs in certain cases—by banning animal sacrifices, for instance, and by ensuring that temples are accessible to Dalits (those who occupy the bottom rungs of the traditional Hindu caste hierarchy, and who were once called untouchables). But Nehru’s use of the word “equally” in the quotation above is slightly misleading, as the state has not observed a clear-cut equidistance vis-à-vis each religious community. This is why Bhargava terms India’s secular approach as one of “principled distance”—not equidistance.6 Indeed, the government has sometimes applied different standards to different religious communities. For example, the state reformed Hindu personal laws according to a series of new Hindu code bills without imposing similar changes on religious minorities. Muslims, for instance, were allowed to retain sharia law. Similarly, the Indian state subsidizes different religious pilgrimages (albeit not necessarily to the same extent), including Sikhs going to Pakistan, Hindus visiting Amarnath Cave in Jammu and Kashmir, and Muslims going to Mecca for the hajj. The state also contributes financially to major religious celebrations such as the Hindu Kumbha Mela; the 2001 festivities in Allahabad, Uttar Pradesh, cost 1.2 billion rupees (or approximately $25 million).7 In practice, the concept of principled distance has not meant that the state interferes equally in all religions or to the same degree or in the same manner in all cases. Starting in the 1980s, Indian secularism came under more severe strain. The Congress Party began opportunistically pandering to one religious community after another more overtly, and Indian secularism was deeply damaged as a result. To begin with, prime minister Indira Gandhi sought to capitalize on religious differences in several blatantly cynical ways. Among other things, she recognized Aligarh Muslim University as a minority institution;8 promoted militant, secessionist Sikhs like Jarnail Singh Bhindranwale to destabilize the Akali Dal, a rival political party in Punjab; and inaugurated the Bharat Mata Mandir, a temple constructed in 1983 with the support of the Vishva Hindu Parishad (VHP), also known as the World Hindu Council. Indira’s son, Rajiv Gandhi, added more fuel to the fire when he became prime minister following his mother’s death in 1984. In the course of handling the divisive Shah Bano case, he sought to invoke sharia as the template for Muslim communal law in India as a way to mollify Indian Muslims.9 This political strategy enabled Hindu nationalists to claim that the Congress Party was indulging in pseudo-secularism—a pejorative term that connotes minority appeasement. Having eroded India’s tradition of secularism through these actions, Indira and Rajiv Gandhi opened the door for Hindu nationalism to gain more widespread political salience. The Hindu nationalist organization known as the RSS was born in 1925 in reaction to a pan-Islamist mobilization of Indian Muslims known as the Khilafat Movement. While the Hindu Mahasabha, the right wing of the Congress Party until Savarkar transformed it into a separate party in 1937, engaged in electoral politics even prior to independence, the RSS chose to focus on developing a dense network of local branches and creating front organizations, including a student union and a labor union. In 1951, the RSS decided it could no longer remain disengaged from electoral politics, so it helped establish a political party, the Bharatiya Jana Sangh (BJS), in conjunction with former Hindu Mahasabha leaders. The constellation of organizations that the RSS created was called the Sangh Parivar, or “the family of the Sangh.”12 This ideological family shares a brand of pro-Hindu cultural nationalism that deemphasizes Islamic contributions to Indian civilization, even though the formation of India’s social fabric and culture involved the mixing of influence from Persia and elsewhere, including in areas like art, architecture, cuisine, and language. The launch of the Ayodhya movement must be understood in light of this speech. In the 1980s, the RSS relied on the VHP to mobilize the majority community around the powerful symbol of Lord Ram. Sangh affiliates demanded that the temple that once allegedly stood above Ram’s supposed birthplace in Ayodhya should be rebuilt in place of the mosque called the Babri Masjid that had since taken its place. The campaign around a prospective Ram mandir (temple) in 1989 resulted in a wave of riots that polarized voters along religious lines. Such polarization helped the BJP win the 1991 state elections in Uttar Pradesh where, in 1992, activists tore the Babri Masjid to the ground to make way for a Ram temple. The demolition of the mosque was a clear reflection of the Sangh Parivar’s anti-secular agenda, which remains its core identity today. For the RSS, turning India into a Hindu rashtra necessitates the eradication of so-called foreign influences, as exemplified by the recent rechristening of cities that previously donned Islamic names, like Allahabad (which is now called Prayagraj), and more importantly, the “obliteration” of Islam and its proponents from the public sphere.14 The actions taken in this regard range from attempts at converting Muslims to Hinduism to preventing interreligious marriages. A handful of years after the Ayodhya movement, the BJP briefly rose to power in New Delhi in 1998 and won elections again in 1999. On both occasions, however, the party was at the helm of a larger coalition, the National Democratic Alliance (NDA), whose other members did not all share a Hindu nationalist agenda. To keep its bloc together, the BJP had to put three of its long-standing policy priorities on the backburner: the construction of a Hindu temple in Ayodhya, the creation of a uniform civil code (or personal law) that applies not only to Hindus but to other religious communities as well, and the abolition of the constitutionally derived autonomous status of Jammu and Kashmir—India’s only Muslim-majority state. Although the party diluted its ideology somewhat while in power, the BJP could not hold its coalition intact as some of its NDA partners resented the anti-Muslim pogrom that took place in Gujarat in 2002 during Narendra Modi’s tenure as chief minister. The BJP lost the 2004 general elections, and the Congress-led coalition that took over from the NDA, the United Progressive Alliance (UPA), returned to a more secular brand of politics, as evident from the appointment of the Sachar Committee to assess the socioeconomic conditions of the Muslim community,15 which the report demonstrated was pitiable.16 While the BJP quickly dismissed the committee report, which recommended specific policy measures to improve the status of the country’s Muslim minority, the UPA won national elections again in 2009. In 2014, for the first time, the BJP won an absolute majority in the lower house of the Indian parliament, the Lok Sabha. Having tasted political power on the national stage for the first time in a decade, the party chose not to resuscitate the three controversial issues mentioned above, but it did pursue actions intended to marginalize Muslims through unofficial channels. For instance, groups of Hindu vigilantes tried to discipline minorities (Muslims and Christians) with the blessing of the state apparatus using a form of cultural policing that had previously been restricted to BJP-ruled states.17 Indeed, this form of vigilantism has prevailed more in BJP-ruled states like Gujarat or Uttar Pradesh, India’s largest state, where Yogi Adityanath (a priest and the head of a Hindu sect) became chief minister in 2017 after the BJP’s electoral triumph. But it has also spread beyond them. For all these groups, the BJP’s rise to power in 2014 was an inflection point: they no longer needed to fear police retribution and, in some cases, even became incorporated into the state apparatus.19 In the state of Haryana, Gau Raksha Dal–affiliated groups—armed with field hockey sticks—patrol the highway linking Chandigarh and New Delhi, where they inspect trucks (often with the blessing of the state police) likely to be transporting cows.20 In Maharashtra, the government has created a new civil service position, called honorary animal welfare officers, in each district. All of the applicants for these posts (whose files have been made public) are gau rakshaks from various militias that regularly intercept alleged traffickers and burn their cargo.21 In several cases, these vigilantes have intercepted and brutally killed Muslim truck drivers who are ferrying cattle.22 Not only have the police rarely arrested the guilty parties (even when witnesses have provided testimony), but even when they have done so, trials have often gone nowhere. The cultural policing of Hindu vigilante groups, who pay allegiance to the RSS, shows that India has, to some extent, become a de facto Hindu rashtra. The influence of the Sangh Parivar at the grassroots level grows with the tacit support of the BJP-dominated state apparatus: while Hindutva forces may indulge in illegal actions, they are often viewed as the legitimate embodiment of majoritarian rule. Has Secularism Become a Dirty Word? Since the 2014 election, surging Hindu nationalism has put the Congress Party—and secularism, more generally—on the back foot. Many Indian scholars have concluded that the BJP is now the new hegemon of Indian politics. The growing consensus seems to be that Hindu nationalism has gained traction at the expense of secularism to the point of being viewed as the only legitimate stance an electorally successful nationwide political party can take.23 The attitude of the Congress Party lends itself to such an interpretation too, at least up to a point, as the party at times has sought to downplay its secularist roots and embrace pro-Hindu sentiments. 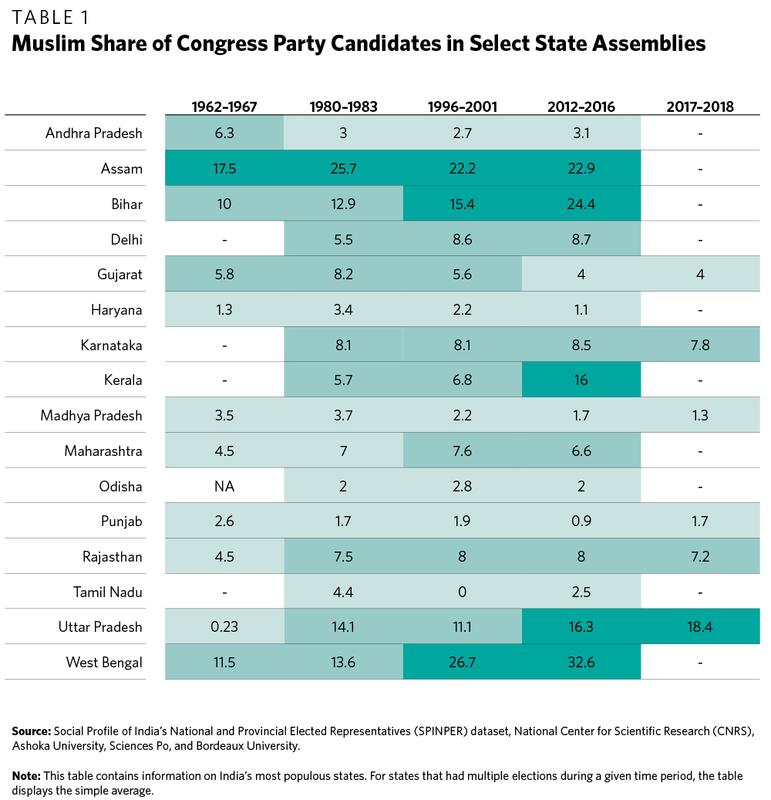 In all these states, with the exception of Assam, the percentage of Muslim candidates fielded by the Congress Party has increased recently. In fact, it is only in two-party states where the Congress Party faces off against the BJP that the party seems to have made a strategic decision to nominate fewer Muslims on the grounds that the minority community has no other choice but to vote for the Congress Party if it hopes to defeat the BJP. The underrepresentation of Muslims among Congress candidates needs to be qualified in at least two other ways. First, the BJP’s underrepresentation of Muslims is far more significant.32 Second, historically speaking, the Congress Party has never nominated many Muslim candidates, even under Nehru and Indira Gandhi, largely because of the steady influence of Hindu traditionalists within the party at the state level.33 But under Nehru and Indira Gandhi (at least until the 1970s), this did not significantly undermine the Congress Party’s secular identity. In fact, over the years, the Congress Party has retained its secular image for several reasons: the secular credentials of many of its top leaders (who often have been more secular than the party cadres and state-level figures); the party’s propensity to nominate a large number of Muslims in certain states; and its concern—especially at the top levels—with the socioeconomic conditions and physical security of minority populations. The acid test for measuring the Congress Party’s commitment to secularism today has less to do with symbolic gestures (like temple visits) or the representation of Muslims in assemblies than with concrete public policy. To date, the party has not moved decisively to implement the Sachar Committee report, at least partially due to pressure emanating from the Sangh Parivar. Whether Congress-led governments at the state level will draw inspiration from this report will be one important indicator of how resilient the Congress Party’s attachment to secularism actually is. A second benchmark is the actual well-being of Muslim citizens. In many BJP-ruled states, minorities have felt threatened because of the slayings of Muslims accused of mistreating cows and, to a lesser extent, the harassment of Christian priests or nuns. Whether Congress-run state governments provide security to minorities and restore their trust in state institutions, including the police, will be an important measure of the party’s secular credentials. On this front, again, the situation varies from one Congress-ruled state to another, according to the capacity of state leaders to resist pressure from Hindu nationalists. But not all Congress Party political figures nationwide share this view. The Congress-affiliated deputy chief minister in Rajasthan, Sachin Pilot, disagreed openly with this attitude, arguing: “It is fine to protect animals that are sacred and I believe in that too, but I think we could have done a better job by prioritising those issues first [including “the dignity of fellow human beings”] and then taken on the cow issue.”37 Such discordant voices offer a good illustration of the traditionally multifaceted character of the Congress Party regarding secularism. While the ideological stances of Congress Party officials have often differed state by state, the contrast between the secular attitude of the top leadership of the Congress Party and the Hindu traditionalism of local party bosses has been evident since the 1950s. This dichotomy was well illustrated by divergent views within the Congress Party on the Sabarimala controversy. In September 2018, the Supreme Court decided to lift the ban on women of any age entering the Sabarimala temple in Kerala.38 Prior to the court’s ruling, women of reproductive age could not enter the temple because Lord Ayyappa (the god to whom the temple is dedicated) had made a vow of celibacy. Whether the Congress Party leadership will impose a coherent line remains to be seen, but its ambivalence toward secularism will not only depend on the popularity of Hindu nationalism. Indira Gandhi indulged in similar ambiguity, and the current iteration of the Congress Party is probably not compromising its secularism any more than Indira Gandhi did in the early 1980s. In addition to the Congress Party, another major institution that has defended secularism in the past but whose operations deserve fresh scrutiny is the judiciary, whose attitudes in recent years have also become more ambivalent. The delicate balance of secularism in India can only be maintained if the rule of law prevails and enables every citizen to feel equal to others, irrespective of community. For that to be true, a watchful judiciary without the taint of religious bias or motivation is required. While the Supreme Court remains the most important Indian institution in this respect, its sometimes contradictory decisions and the communal overtones espoused by some lower judiciary officials have contributed to the erosion of secularism. The Ayodhya affair is perhaps the best illustration of this dynamic. After the Babri Masjid was destroyed in 1992, the Indian government appointed a one-man commission led by former Supreme Court justice Manmohan Singh Liberhan. The resulting report, which took seventeen years to complete and whose contents were finally leaked to the media, assigned responsibility for the demolition of the mosque to clearly identified Hindu nationalist figures.46 To date, however, the judicial branch has not asked the government to table the report in the parliament or to file charges. This delay suggests that trying Hindu nationalists in this case is seen as too politically sensitive. While the Liberhan report continued to languish, the Allahabad High Court continued to examine the arguments of the Muslims and Hindus who claim that the disputed site where the mosque was built belongs to them. In 2010, the court finally issued a contentious ruling that reflected the divisions between the judges involved.47 One of the three justices, who dissented, sought to give all the disputed land to the case’s Hindu parties on the basis of his reading of relevant Hindu mythology. The remaining justices, one of whom was Hindu while the other was Muslim, penned a majority judgment that was convoluted to put it mildly. In this and other instances, India’s Supreme Court increasingly has had to remind the country’s various high courts of fundamental secular principles as the lower courts have become more inclined to indulge in Hindu majoritarianism. For instance, the murder of a young Muslim man in the city of Pune offers a clear example of these tensions. Mohsin Shaikh, a young engineer, was coming back from the mosque when he was killed by a group of Hindu activists who had just attended a meeting of a group called the Hindu Rashtra Sena that was organized to protest social media posts depicting derogatory images of Shivaji (a historical Hindu warrior king) and Bal Thackeray (the founder of the nationalist party known as the Shiv Sena, a steadfast BJP ally). These examples suggest that, although the Supreme Court has generally tried to remain faithful to the secular character of the Indian Constitution, lower courts have occasionally espoused Hindu majoritarian viewpoints. As far as the judiciary is concerned, the Supreme Court is arguably one of the last reliable custodians of India’s secularism, and its attitude vis-à-vis high-profile cases such as the Ayodhya case going forward will be scrutinized even more closely. Hindu nationalism is depriving India of one of its main assets, at a time when countries around the world are struggling to cope with religious diversity. By countering this worldview and the secular political culture that has emerged from it, Hindu nationalism is depriving India of one of its main assets, at a time when countries around the world are struggling to cope with religious diversity. For instance, French Prime Minister Édouard Philippe has indicated that his country may have to reform its famous 1905 law codifying laïcité (the country’s strict conception of secularism, which forbids government involvement in religious affairs) to make room for religion in the public space again, after the recent growth in the number of French citizens who practice Islam. Despite the apparent ascendance of Hindu nationalism under the BJP, however, it may be premature to conclude that this brand of nationalism has established undisputed hegemony over Indian politics and society. In fact, secularism may indirectly benefit from the reactivation of caste identities, which often can undermine religious identities. In the run-up to India’s 2019 general election, even the BJP has tried to exploit caste identities by introducing new positive discrimination (affirmative action) policies.55 For citizens from less privileged economic backgrounds who belong to the general category (that is, primarily the upper castes or those untouched by existing state quotas), Modi announced in January 2019 a 10 percent quota for educational institutions and civil service posts. In addition, the BJP government in Maharashtra has supported the idea of reservations for Marathas (a dominant caste of farmers).56 The fact that a party that has consistently claimed that caste politics serve to divide the nation has decided to play this card too is a sign of this strategy’s resilience. In the years ahead, caste politics may well gain momentum at the expense of Hindu communalism and indirectly contribute to a more secular approach to politics by dividing the pan-Hindu coalition that the BJP depends on for its majority. This development is all the more likely to be the case if class considerations (such as the country’s urban/rural divide) become more salient. Such developments would probably bring social and socioeconomic issues back to the fore and could serve as a counterweight to resurgent Hindu majoritarianism. 1 Christophe Jaffrelot, “Composite Culture Is Not Multiculturalism: A Study of the Indian Constituent Assembly Debates,” in Ashutosh Varshney, ed., India and the Politics of Developing Countries: Essays in Memory of Myron Weiner (New Delhi: Sage, 2004): 126–149. 2 Christophe Jaffrelot and Sanjay Kumar, Rise of the Plebeians? : The Changing Face of the Indian Legislative Assemblies (New Delhi: Routledge, 2009). 3 “The Representation of the People Act, 1951,” Government of India, Ministry of Law and Justice, Legislative Department, http://www.legislative.gov.in/sites/default/files/04_representation%20of%20the%20people%20act%2C%201951.pdf. 4 Sarvepalli Gopal, ed., Jawaharlal Nehru: An Anthology (New Delhi: Oxford University Press, 1980): 330. 5 Rajeev Bhargava, “What Is Secularism For?” in Rajeev Bhargava, ed., Secularism and Its Critics (New Delhi: Oxford University Press, 1988). 7 Praveen Swami, “Salman Rushdie and India’s New Theocracy,” Hindu, January 21, 2012, https://www.thehindu.com/opinion/lead/Salman-Rushdie-amp-Indias-new-theocracy/article13379227.ece. 8 To be more precise, a new provision was inserted into the Aligarh Muslim University Amendment Act, a provision which allowed the university “to promote especially the educational and cultural advancement of the Muslims of India.” See Abdul Shaban, ed., Lives of Muslims in India: Politics, Exclusion, and Violence, second edition, (New Delhi: Routledge, 2018). 9 In 1985, the Congress-led government passed a law reasserting the role of sharia in cases of divorce in the Muslim community. This decision was made in response to demonstrations orchestrated by Muslim leaders after the Supreme Court had established the right of Shah Bano, a divorced Muslim woman, to alimony—a ruling that went against the standard interpretation of sharia. At the time, the BJP denounced the law passed by the Congress-led government as a sign of the ruling party’s pro-Muslim attitude. 10 Vinayak Damodar Savarkar, Hindutva: Who is a Hindu? (Bombay: Veer Savarkar Prakashan, 1969). 11 “Population Census 2011,” Census Organization of India, 2011, https://www.census2011.co.in/. 12 Christophe Jaffrelot and Ingrid Therwath, “The Sangh Parivar and the Hindu Diaspora in the West: What Kind of ‘Long-Distance Nationalism’?” International Political Sociology 1, no. 3 (September 2007): 278–295. 13 These words come from Balasaheb Deoras’s January 1979 speech at the second International Hindu Conference in Allahabad. See Christophe Jaffrelot, The Hindu Nationalist Movement in India, (New York: Columbia University Press, 1996), 346. 14 For more details, see Christophe Jaffrelot, “A De Facto Ethnic Democracy? The Obliteration and Targeting of the Other: Hindu Vigilantes and the Making of an Ethno-State,” in Angana P. Chatterji, Thomas Blom Hansen, and Christophe Jaffrelot, eds., Majoritarian State: How Hindu Nationalism is Changing India (New Delhi: HarperCollins, 2019). 15 The Sachar Committee was a panel established by the previous Congress-led central government to study the state of the Muslim community in India. The committee is informally known as the Sachar Committee in honor of its chairman, Rajinder Sachar. Christophe Jaffrelot and Kalaiyasaran A., “The Myth of Appeasement,” Indian Express, April 20, 2018, https://indianexpress.com/article/opinion/columns/muslims-socio-economic-development-5144318/. 18 For more details, see Christophe Jaffrelot, “Towards a Hindu State?” Journal of Democracy 28, no. 3 (July 2017): 52–63. 20 Ishan Marvel, “In the Name of the Mother,” Caravan, September 1, 2016, https://caravanmagazine.in/reportage/in-the-name-of-the-mother. 21 Smita Nair, “Refrain in Sangh Turf: Cards Will Give Us Power,” Indian Express, August 23, 2016, https://indianexpress.com/article/india/india-news-india/maharashtra-government-beef-ban-gau-rakshak-id-cards-animal-husbandry-modi-sangh-turf-2991489/. 22 David Barstow and Suhasini Raj, “Indian Muslim, Accused of Stealing a Cow, Is Beaten to Death by a Hindu Mob,” New York Times, November 4, 2015, https://www.nytimes.com/2015/11/05/world/asia/hindu-mob-kills-another-indian-muslim-accused-of-harming-cows.html. 23 See, for instance, Suhas Palshikar, “Toward Hegemony: BJP Beyond Electoral Dominance,” in Chatterji, Hansen, and Jaffrelot, eds., Majoritarian State: How Hindu Nationalism is Changing India (New Delhi: HarperCollins, 2019). 24 T.K. Arun, “View: Soft Hindutva Approach Can Prove Disastrous for Congress,” Economic Times, November 28, 2018, https://economictimes.indiatimes.com/news/politics-and-nation/view-soft-hindutva-approach-can-prove-disastrous-for-congress/articleshow/66834398.cms. 25 Like his grandmother Indira Gandhi, Rahul Gandhi also visits Muslim places of worship in spite of the uproar such visits provoke on social media. 26 Rahul Gandhi’s gotra took center stage during the December 2018 state assembly election campaigns after BJP leaders called the gotra that Gandhi had declared during his visit to the Brahma temple in Pushkar, Rajasthan, a fake. See Balkrishna and Chayan Kundu, “Rahul Gandhi a Dattatreya Brahmin? Decoding the Gandhi Gotra,” India Today, November 27, 2018, https://www.indiatoday.in/elections/story/rahul-gandhi-a-dattatreya-brahmin-decoding-the-gandhi-gotra-1397570-2018-11-27. 27 Interestingly, the BJP had first conceived of this project in 2007. Eleven years later, even as the BJP failed to complete it, the Congress Party promised to implement it. See Suchandana Gupta, “Congress to Start Work on BJP’s Ram Gaman Path From September 21,” Times of India, September 13, 2018, https://timesofindia.indiatimes.com/india/congress-to-start-work-on-bjps-ram-gaman-path-from-september-21/articleshow/65773703.cms. 28 Milind Ghatwai, “Madhya Pradesh Elections: Congress Manifesto Reflects Bid to Shed ‘Pro-Muslim’ Tag,” Indian Express, November 28, 2018, https://indianexpress.com/elections/mp-congress-manifesto-reflects-bid-to-shed-pro-muslim-tag-5467989/. 30 The figures used here come from the Social Profile of India’s National and Provincial Elected Representatives (SPINPER) database, a joint initiative of the French National Center for Scientific Research, Ashoka University, Sciences Po, and Bordeaux University. Data available from the author. Christophe Jaffrelot and Gilles Verniers, “Invisible in the House,” Indian Express, May 28, 2014, https://indianexpress.com/article/opinion/columns/invisible-in-the-house/. 32 Christophe Jaffrelot and Gilles Verniers, “The Dwindling Minority,” Indian Express, July 30, 2018, https://indianexpress.com/article/opinion/columns/muslims-politicians-in-india-bjp-narendra-modi-government-5282128/. 33 See Christophe Jaffrelot, “The Roots and Varieties of Political Conservatism in India,” Studies in Indian Politics 5, no. 2 (November 2017): 205–217; and Christophe Jaffrelot, “The Congress in Gujarat (1917–1969): Conservative Face of a Progressive Party,” Studies in Indian Politics 5, no. 2 (November 2017): 248–261. 34 Milind Ghatwai, “Madhya Pradesh: Congress to Hold Bigger Vande Mataram Event,” Indian Express, January 4, 2019, https://indianexpress.com/article/india/madhya-pradesh-congress-to-hold-bigger-vande-mataram-event-5522516/. 35 Between 2007 and 2016, the previous BJP government in Madhya Pradesh had used the same law twenty-two times, a practice denounced by human rights NGOs. See Milind Ghatwai, “In MP, This Time Under Congress, Three Held Under NSA for Cow Slaughter,” Indian Express, February 6, 2019, https://indianexpress.com/article/india/in-mp-this-time-under-cong-three-held-under-nsa-for-cow-slaughter-5571019/. 37 “People First, Not Cows, Says Sachin Pilot”, Hindu, February 10, 2019, https://www.thehindu.com/news/national/prioritise-crimes-against-humans-sachin-pilot/article26231179.ece. 38 Samanwaya Rautray, “Women of All Ages Can Enter Sabarimala Temple, Rules Supreme Court,” Economic Times, September 29, 2018, https://economictimes.indiatimes.com/news/politics-and-nation/supreme-court-allows-women-to-enter-sabarimala-temple/articleshow/65989807.cms. 39 “Sabarimala: Rahul Gandhi Contradicts Congress Stand, Favours Women Entry,” Week, October 30, 2018, https://www.theweek.in/news/india/2018/10/30/sabarimala-rahul-gandhi-contradicts-congress-stand-favours-women-entry.html. 40 On the BJP’s instrumentalization of the Sabarimala issue, see Christophe Jaffrelot, “No Room for Liberal Doubt,” Indian Express, November 20, 2018, https://indianexpress.com/article/opinion/columns/sabarimala-temple-women-entry-protests-bjp-5454465/. 41 “Rahul Gandhi Edits View On Sabarimala To An Election-Friendly Version,” NDTV.com, January 13, 2019, https://www.ndtv.com/india-news/rahul-gandhis-changed-position-on-sabarimala-accommodates-tradition-1977041. 42 Milan Vaishnav and Danielle Smogard, “A New Era in Indian Politics?,” Carnegie Endowment for International Peace, June 10, 2014, https://carnegieendowment.org/2014/06/10/new-era-in-indian-politics-pub-55883. 43 The Communist Party of India (Marxist) chief minister of Kerala, Pinarayi Vijayan, commented on the Congress’s brand of soft Hindutva in very revealing terms when he said: “If the Congress tries to follow [the] RSS or Sangh Parivar stand on every issue, how can it strengthen secularism?” See Liz Mathew, “‘If Congress Tries to Follow Sangh Stand, How Can It Strengthen Secularism?’ Asks Pinarayi Vijayan,” Indian Express, February 9, 2019, https://indianexpress.com/article/india/if-cong-tries-to-follow-sangh-stand-how-can-it-strengthen-secularism-5575943/. 45 Ish Mishra, Mohan Rao, Pragya Singh, and Vikas Bajpai, “Fact Finding Report: Independent Inquiry into Muzaffarnagar ‘Riots,’” Economic and Political Weekly 49, no. 2 (January 11, 2014), https://www.epw.in/journal/2014/2/reports-states-web-exclusives/fact-finding-report-independent-inquiry-muzaffarnagar. 46 Government of India Ministry of Home Affairs Liberhan Ayodhya Commission, Report of the Liberhan Ayodhya Commission of Inquiry (New Delhi: Government of India, 2009), https://mha.gov.in/about-us/commissions-committees/liberhan-ayodhya-commission. 47 Allahabad High Court, “Other Original Suit (O.O.S.) No.1 of 1989 (Regular Suit No.2 of 1950) Gopal Singh Visharad Since Deceased and Survived by Rajendra Singh Vs. Zahoor Ahmad and Others,” September 30, 2010, http://elegalix.allahabadhighcourt.in/elegalix/ayodhyafiles/honsukj.pdf. 48 Nivedita Menon, “The Second Demolition,” Kafila.org (blog), September 30, 2010, https://kafila.online/2010/10/02/the-second-demolition-ayodhya-judgement-september-30-2010/; Nivedita Menon, “The Ayodhya Judgment: What Next?” Economic and Political Weekly 46, no. 31 (July 30, 2011): 81–89; Christophe Jaffrelot, “The Ayodhya Verdict: One More Missed Opportunity?” Caravan, October 1, 2010, https://caravanmagazine.in/perspectives/ayodhya-verdict-one-more-missed-opportunity; and Christophe Jaffrelot, “Ayodhya Issue,” CERI-Sciences Po, June 2017, https://cpb-us-e1.wpmucdn.com/sites.northwestern.edu/dist/c/1549/files/2017/06/jaffrelot_ayodhya-issue-1eaj99h.pdf. 49 Sanjay Hegde and Pranjal Kishore, “The Ayodhya Verdict Can Shake the Very Foundations of India,” Quartz India, February 8, 2018, https://qz.com/india/1199361/babri-masjid-ayodhya-dispute-the-supreme-court-verdict-can-shake-the-very-foundations-of-india/. 51 J. Venkatesan, “Supreme Court Stays Allahabad High Court Verdict on Ayodhya,” Hindu, May 9, 2011, https://www.thehindu.com/news/national/Supreme-Court-stays-Allahabad-High-Court-verdict-on-Ayodhya/article10751917.ece. 52 Alok Prasanna Kumar, “Is the Bombay High Court Saying a Hate Crime Isn’t Heinous?,” Wire, January 16, 2017, https://thewire.in/law/bombay-high-court-hate-crime. 53 Supreme Court of India, Mubin Shaikh vs the State of Maharashtra, February 8, 2018, https://indiankanoon.org/doc/26323572/. 54 Saghal made these remarks after her invitation to inaugurate the ninety-second Akhil Bharatiya Marathi Sahitya Sammelan (All India Festival of Marathi Literature) in Yavatmal had been revoked. “We Should Not Lose Our Hindustaniyat, Says Nayantara Sahgal,” Indian Express, January 30, 2019, https://indianexpress.com/article/cities/mumbai/nayantara-sahgal-we-should-not-lose-our-hindustaniyat-5560427/. 55 “Modi Govt Okays 10% Quota in General Category. Here’s Who Will Benefit,” Hindustan Times, January 7, 2019, https://www.hindustantimes.com/india-news/modi-govt-okays-10-quota-in-general-category-here-s-who-will-benefit/story-exczpVuPM0LZrOXGbLFOLJ.html.